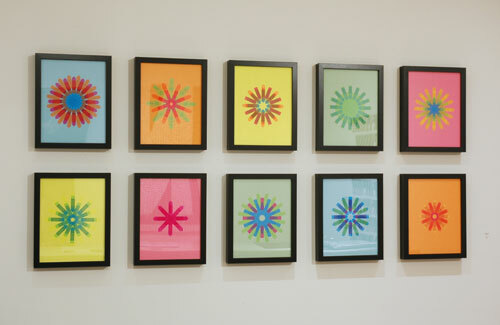 Positive Signs, 2011, glitter pen, fluorescent pen, foil print, gridded vellum, 8.5 × 11 in / 21.5 × 28 cm. In Other Words is a group exhibition that looks at language and its capacity to clarify and confuse, convene and separate, inspire and discourage. By exploring a range of areas concering the influence and evolution of language in our lives—the impact of technology, the obscurity of industry-specific terminology, the psychological internalization of language, and the recontextualization of language—the artists in this exhibition demonstrate through a diversity of media the many ways in which we strive to communicate to each other. Read reviews on SFGate, Zero1 blog, and the East Bay Monthly. View opening photos on ArtBusiness.com. Each of these artists visually articulates works inspired by their diverse and rich cultural and ethnic backgrounds. Artists: Noel Anderson, Kajahl Benes, Elaine Bradford, Elizabeth Colomba, Jamal Cyrus, Nathaniel Donnett, Zak Ové, Leslie Smith III, Devin Troy Strother, Felandus Thames, and Christine Wong Yap. Give Thanks, 2011 site-specific installation of 39 pennant flags: satin ribbon, linen, gratitude statements, dimensions site-variable.